Car Seats For Toddlers - Top 5 Models Comparison! Just like there are a variety of infant car seats designed for newborns and babies under 30lbs, there are also several designs and models for car seats for toddlers in the weight range from 30lbs to 100lbs. Although car seat regulations differ from state to state, the majority of regulations state that children that are under one year and under 30lbs must face the rear of the vehicle to avoid injury from an airbag, and distraction to the driver. Once they reach 30lbs, they are no longer safely protected from an accident in their infant car seat and must be placed in a seat more appropriate for toddlers. Among the best car seats for toddlers that have just outgrown the rear facing car seat is the convertible car seat. This model is the kind that was also used as an infant car seat that can be turned around to be forward facing. Most forward facing toddler seats have tether straps that can now be used to secure the back of the car seat near the head rest, a feature that wasn’t necessary before. This car seat model also continues to use the 5 point safety harness because at 30lbs your baby isn’t large enough, or tall enough to use the seatbelt and shoulder straps yet. Unlike most car seats, the convertible car seat is the most difficult to move from vehicle to vehicle as it does not work as a carrier, and does not have a base that can be left in the car. Another excellent car seat for toddlers is the combination car seat. The combination seat is much like the convertible seats used for both infants and toddlers. 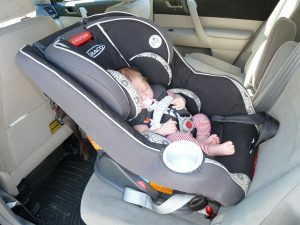 A combination toddler car seat is a front facing car seat that cannot be used for infants or as a rear facing car seat. It has a larger car seat base and still uses the five point safety harness if your toddler is under 40bs. When your child is over 40lbs, the harness can be removed and your vehicle’s safety belts can be used. The base is tall enough so that your vehicle’s shoulder belt should safely go over your child’s shoulder. Some designs also have a guide to keep the shoulder belt from interfering with your child’s neck. These seats can be used until your child reaches 80-100llbs and are easy to move from vehicle to vehicle. One of the most popular toddler car seats is the high back booster seat. The high back booster seat also faces the front of the car and is used for children between 80-100lbs. It usually has a base and a back that is about as high as your vehicle’s back seat and includes a built-in head rest to protect the head and neck from being forced backwards during an impact. The seat is also heightened to allow for the vehicle’s shoulder strap to rest on the child’s shoulder and extend across the rib cage. The belt should not touch the child’s face, neck or go across their chest. The most inexpensive car seats for toddlers is the backless booster seat. The backless booster seat is also the easiest to move around. It is used to elevate a child so that their head reaches the vehicle’s head rest and the shoulder and lap belt fit accordingly. If your vehicle does not come with head rests it is actually a regulation that a high-back booster seat is used, not a backless. Most booster seats now come with cup and shack holders and don’t need to be anchored to the vehicle using the LATCH system. The LATCH system is designed for vehicles manufactured after 2002. It has become an industry standard and stands for Lower Anchors and Tethers For Children. All child car safety seats, rear or front facing that do not rely on the vehicle’s seat belts must be anchored to the anchor bars at the bottom seat level and forward facing car seats must be tethered using the tethering bars located at the top of the vehicles seat by the head rests.